Alexandre Michel Gérard Desplat (French: [a.lɛk.sɑ̃dʁ dɛs.pla]; born 23 August 1961) is a French film composer. He has won two Academy Awards for his musical scores to the films The Grand Budapest Hotel and The Shape of Water, and received eight additional Academy Award nominations, eight César nominations (winning three), nine BAFTA nominations (winning three), ten Golden Globe Award nominations (winning two), and six Grammy nominations (winning two). Desplat has worked on a variety of films, including independent and commercial successes The Queen, The Golden Compass, The Curious Case of Benjamin Button, The Twilight Saga: New Moon, Fantastic Mr. Fox, Harry Potter and the Deathly Hallows – Part 1 & Part 2, The King's Speech, The Danish Girl, Moonrise Kingdom, Argo, Rise of the Guardians, Zero Dark Thirty, Godzilla, The Imitation Game, Unbroken, The Secret Life of Pets, and Isle of Dogs. Desplat was born in Paris, to a French father and a Greek mother who met at the University of California, Berkeley. After their marriage, they moved back to France, where Alexandre was born. Alexandre is the younger brother of Marie-Christine, also known as Kiki, who leads the jazz band "Certains l'Aiment Chaud", and of Rosalinda Desplat. At the age of five, he began playing piano. He also became proficient on trumpet and flute. He studied with Claude Ballif, Iannis Xenakis in France and Jack Hayes in the United States. Desplat swiftly became a skilled performer and composer. Desplat's musical interests were wide, ranging from early twentieth-century French composers, like Ravel and Debussy, to jazz and world music. He was also influenced by South American and African artists, among whom were Carlinhos Brown and Ray Lema. A film fan, Desplat set his sights on becoming a film composer from an early age and acted to make the dream a reality as he started his career. He worked on his first film Le souffleur in 1986. When recording the music for his first film, he met violinist Dominique Lemonnier who became his favorite soloist, artistic director, and also his wife. Desplat worked on many films since the 1980s, and his big Hollywood break came in 2003 with the soundtrack for the film Girl with a Pearl Earring. In early 2011, Desplat began to write the music to Harry Potter and the Deathly Hallows – Part 2. He reunited with director David Yates, who offered Desplat the opportunity to score the second part after his work on the Part 1 soundtrack in 2010 "enchanted everyone in the control room". Desplat's soundtrack sequel to the 2008 film Largo Winch was released in 2011 and was well received. Desplat's 2011 projects included The Tree of Life, directed by Terrence Malick (which he actually recorded in early 2010), A Better Life, La Fille du Puisatier, Roman Polanski's Carnage, George Clooney's Ides of March, and the logo for the French film company StudioCanal. In 2018, he won his second Academy Award for The Shape of Water and premiered a new work for solo flute played by Emmanuel Pahud. My Week with Marilyn Simon Curtis "Marilyn's Theme"
Desplat has received many awards and nominations for his work including two Academy Awards, three BAFTA Awards and two Golden Globe Awards. ^ Burlingame, Jon (7 January 2007). "Thinking in Colors and Textures, Then Writing in Music". The New York Times. Retrieved 31 August 2011. ^ "Certains l'aiment chaud Web site". Certainslaimentcloud.com. Retrieved 15 June 2015. ^ Hischak, Thomas S. (16 April 2015). The Encyclopedia of Film Composers (in Arabic). Rowman & Littlefield. ISBN 978-1-4422-4550-1. ^ a b c "Biography". Alexandredesplat.net. Retrieved 28 January 2014. ^ "Biography & Filmography". Alexandredesplat.net. Retrieved 28 January 2014. ^ Burlingame, Jon (5 November 2014). 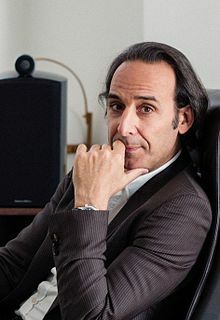 "Billion Dollar Composer: Alexandre Desplat Has Ears of World's Top Auteurs". Variety. Retrieved 26 May 2016. ^ "How Alexandre Desplat creates a film score in three weeks – BBC News". BBC News. Retrieved 26 May 2016. ^ "Scoring for the screen: Composers and film directors work in harmony | Film Journal International". Filmjournal.com. Retrieved 26 May 2016. ^ "Interview with Alexandre Desplat :: Film Music Magazine". Filmmusicmag.com. Retrieved 26 May 2016. ^ Herrera, Monica; Lipshutz, Jason; Mapes, Jillian (25 January 2011). "Reznor, Rahman, Zimmer & More React to Their Oscar Nominations". Billboard. Retrieved 31 August 2011. ^ Dargis, Manohla (23 June 2011). "'A Better Life,' Directed by Chris Weitz – Review". The New York Times. ISSN 0362-4331. Retrieved 26 May 2016. ^ "Venice Names Alexandre Desplat To Head Fest Competition Jury". Deadline.com. 23 June 2014. Retrieved 23 June 2014. ^ Dargis, Manohla (19 November 2009). "For Kristen Stewart, Abstinence Makes the Heart ... You Know". The New York Times. ISSN 0362-4331. Retrieved 26 May 2016. ^ "Godzilla". Legendary.com. Retrieved 15 May 2014. ^ "Alexandre Desplat Takes Over Scoring Duties on 'The Imitation Game' - Film Music Reporter". Filmmusicreporter.com. ^ "Alexandre Desplat to Score 'The Secret Life of Pets'". filmmusicreporter.com. 3 December 2015. Retrieved 3 December 2015. ^ "Alexandre Desplat to Return for 'The Secret Life of Pets 2' - Film Music Reporter". filmmusicreporter.com.